18th - 20th at Caesars Palace in Las Vegas, Nevada. Booth #219. At two schools in the Pacific Northwest, daylit classrooms stand in small clusters rather than linear arrays along corridors. 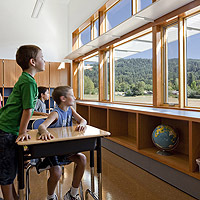 Architecture firm Mahlum designed these buildings - Gray Middle School in Tacoma, Washington, and Thurston Elementary School in Springfield, Oregon - to foster small "learning communities" within each school. classrooms - three such clusters on each floor. either northern or southern exposures. building products center in the New York metropolitan area. What is an air spade? ArchWeek Notes newsletter archive for No. 490 and earlier.